Brando’s Pick of the Month. 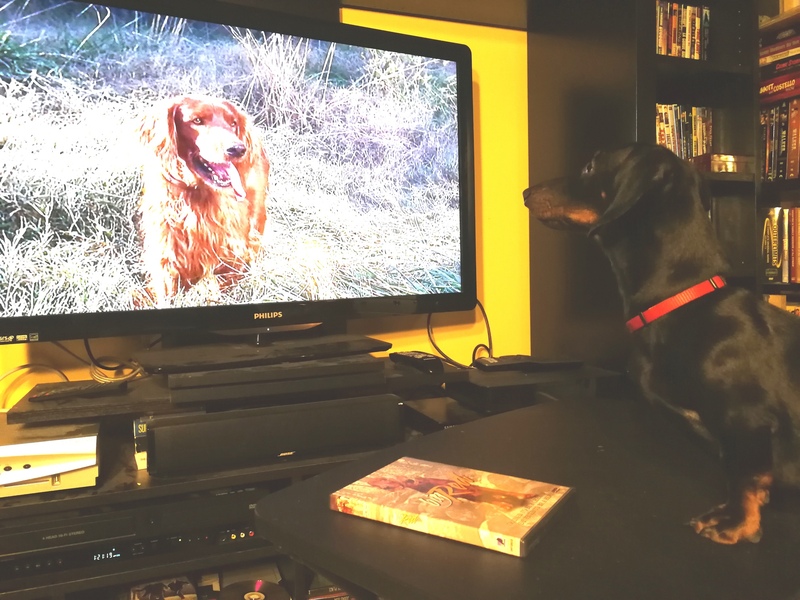 No it isn’t Walter Pidgeon that attracted Brando to this Disney feature, it’s the colorful Irish Setter taking center stage that makes this doggie adventure his choice pick for March. This Norman Tokar film courtesy of Uncle Walt’s banner takes place in Quebec, Canada. 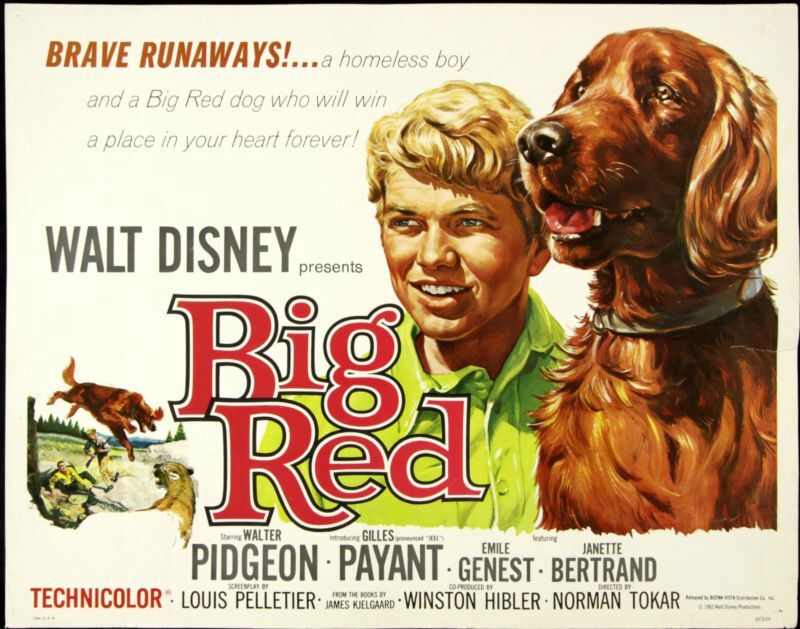 It’s in Montreal that Walter Pidgeon sees Big Red performing at a local dog show winning a nice blue ribbon and he just has to have him. A check for $5000 is issued and the dog is his. From here forward he plans to fine tune Red into championship stock and take him to New York City for the annual big city dog show. Should be win, there will be little trouble in doubling his money. The firm handed Pidgeon is a wealthy landowner who has a French couple working for him. Adding an authentic feel to the Quebec backdrop, Emile Genest and Janette Bertrand have been cast. Both are French Canadian. Emile being born in Quebec City, Janette in Montreal. Janette rules the kitchen while Emile looks after the show dogs that Pidgeon has on his farm. Drifting into Pidgeon’s world is a young orphaned boy played by another French Canadian, 15 year old Gilles Payant. He’s looking for work and Pidgeon hires him on to help with the dogs under Emile’s guidance. 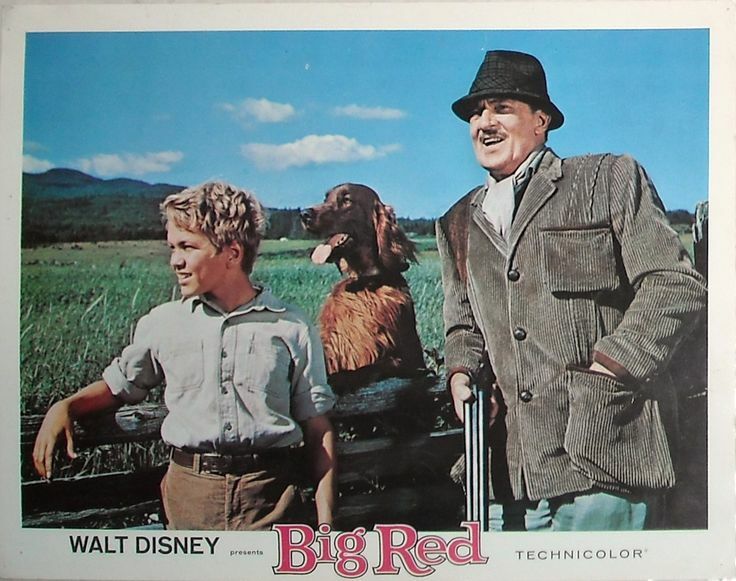 One look at Big Red and the boy has found a best friend and the dog a companion to give his loyalty to. In fine Disney fashion, the two will enjoy each others company racing through the beautiful countryside across fields and streams. When the next training session for Red proves to be ill fated, Pidgeon realizes the dog isn’t focused on his commands but will only obey the boy. Putting a stop to this, he separates the two so he can better prepare Red for New York. Pidgeon is going to have to realize that love conquers all. When the dog crashes through a glass window to reach the boy, he suffers serious cuts and cold hearted Walter tells Emile to put the dog down. Thankfully young Payant makes off with Red in his arms heading back to his abandoned homestead in the hills. It’s here that he will bring Red back to health and also return him to Walter and face any punishment owed to him. Walter is thankful and the boy feels it’s time for him to move on and says his farewells to Walter and Red. As Red is no longer a show dog, Pidgeon decides to sell him along with a female he’d recently acquired with the idea of breeding them. A chance encounter with a Moose is going to change all that. Yes a Moose. This is Canada after all. When one of the big animals saunters along the railway forcing a train to stop in the Canadian wilderness, the two dogs will jump to the ground and disappear in the Quebec countryside. When news of this reaches the boy, he quits working the farm next to Pidgeon’s and is off to find them. At the same time when Pidgeon hears that the boy is off looking for the dogs, his heart melts and he’s off to find the boy and a love he too is in need of. Both Pidgeon and Payant will face dangers in the forested area that presents rock faced cliffs and mountain lions. In fine Disney fashion, the pair will unite but will we have a tear jerking ending as we did in Old Yeller? I’m not saying and neither is Brando but when Walter falls off his horse and that mountain lion is closing in, the boy and Red will charge to his defense. Either way, at least Red has kept the blood line going giving us plenty of pups to hold near and dear at the fadeout. 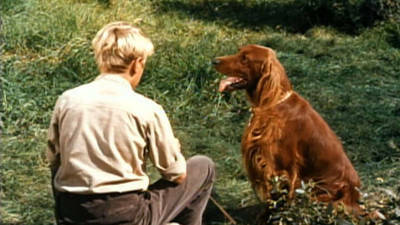 Big Red is beautifully filmed with plenty of outdoor splendor highlighted by one gorgeous dog. Not knowing the story of Big Red, I thought I had it all figured out at the twenty minute mark. Walter buys the dog, he can’t control him so he has the boy walk him in the ring for the big New York meet and wins the Best In Show but decides to keep Red instead of selling him, gifting him to the boy. I guess I had it wrong. Brando? I believe he knew the whole story from the start. He even gave me a sly look when I commented about my thoughts on the outcome. Brando and I picked this one up not long ago in a second hand shop. While it is a Disney release, the DVD we scored was put out via the Anchor Bay label a number of years ago. Recommended for both kiddies of all ages and doggies alike. I saw this back in ’62, as a seven-year old, on a double-bill with “The 300 Spartans”. 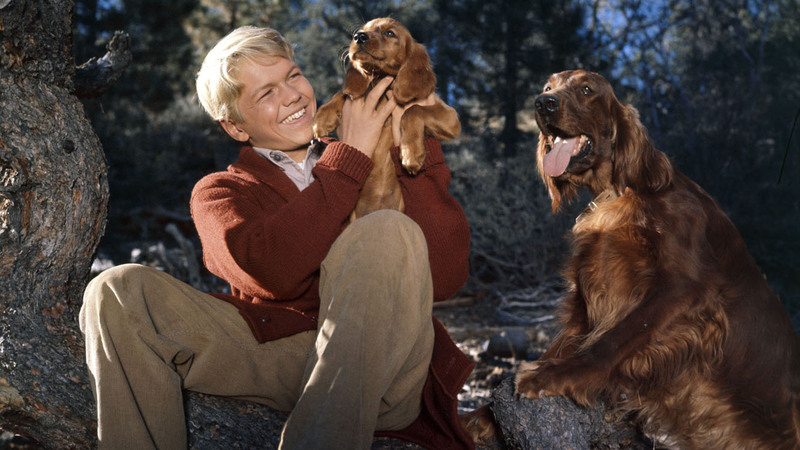 Haven’t seen t since, but I have trace memories of the color (Disney movies always looked great), especially the dog’s shiny coat, and Pidgeon being rather stuffy. The other (much underrated) movie became a lifelong favourite. Nice memory to share. This was my first viewing. I saw Spartans as a kid on TV and of course loved it. Fuels a little ones imagination. Brando is, indeed, giving you a Look. 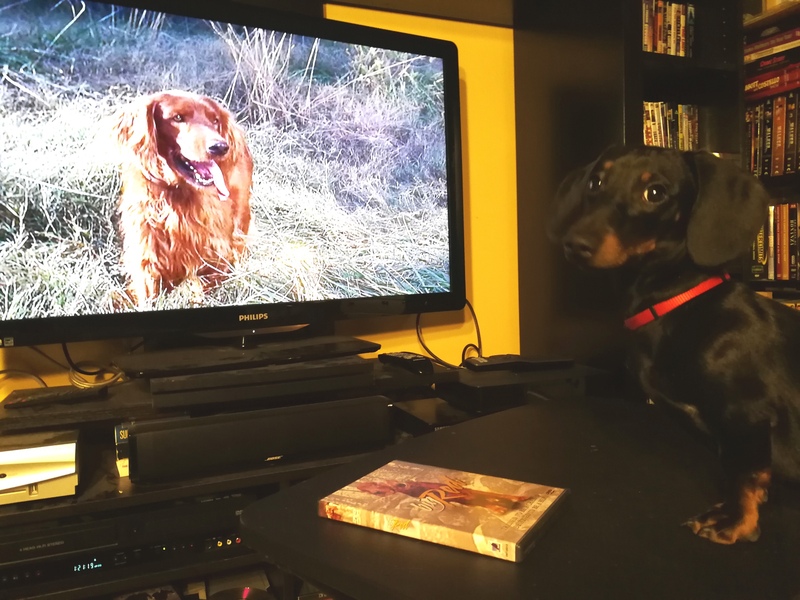 He is such a photogenic dog – and he has good taste in movies, too. I haven’t seen this film yet, but have heard good things about it. If Brando gives it two paws up, then I’ll look for it at the library. lol. Yes indeed two paws up from the little guy. Never heard of this one, but it sounds pretty cool…and a nice-looking dog, too. And it seems like it would’ve made for a good ‘O, Canada’ blogathon entry as well. After I started watching this I thought the same thing about the Canada fest. I’ll have to find another doggie tale next year that will fit the idea with Brando along for the ride.